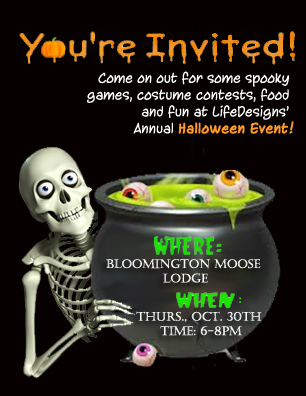 Come one, come all to LIFEDesigns annual Halloween Masquerade Party. The party will be held this year at the Moose Lodge. Come on out for a spooky night filled with delicious treats and fun activities. As usual, part of the fun will be watching three lucky winners get a pie in the face! LIFEDesigns office staff is currently holding a penny pitch to decide exactly who those winners will be. If there is someone you would love to see get pie-ed, bring your pennies to LIFEDesigns office on Winslow to “vote” for the winners. The Penny War continues through October 24 5:00 pm and funds donated benefit United Way Agencies, including LIFEDesigns. Don’t be afraid to come dressed in your spookiest costume, it’s all part of the fun! 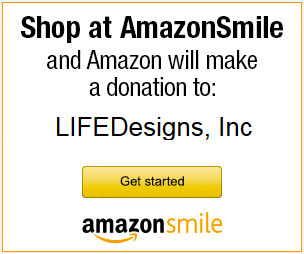 Contact Stephanie Shelton sshelton@lifedesignsinc.org or (812) 332-9615 if you would like to volunteer or donate to support this fun activity for all LIFEDesigns customers, staff, donors, and supporters.